Stunning 3 Bed, 2 Bath, with a Pass-thru Kitchen, Spacious Living/Dining Area, Great Closet Space! TWO MONTHS FREE on 18 mo lease (or one month free on 12 mo lease). Gross rent advertised! $1,000 Security Deposit, exclusions apply. 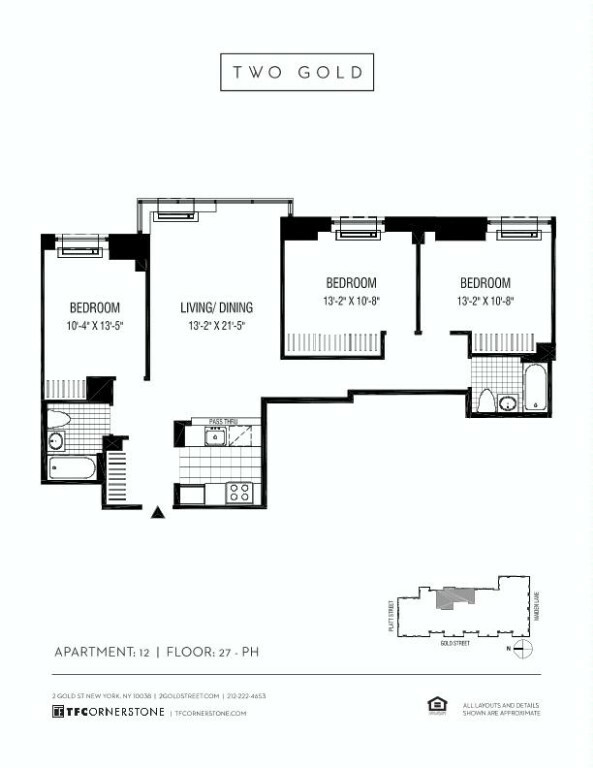 Stunning 3 Bed, 2 Bath, with a Pass-thru Kitchen, Spacious Living/Dining Area, Great Closet Space Amazing Light and Views of the East River! All apartments have floor-to-ceiling thermopane windows, hardwood strip flooring, and premium stainless steel appliances. Many homes feature open floor-plans, large closets, extra-high ceilings and private terraces or balconies with stunning views. Two luxury residential towers soar high above Manhattan's downtown neighborhood, offering a refreshing escape from the world's most vibrant city. Retreat inside to one of our spacious apartments, relax and indulge in our amazing amenities or rediscover where New York City began. Two Gold is the perfect choice for those with higher expectations. With its grand tower soaring 51-stories and adjoining 'sister tower rising 26-stories, Two Gold Street is located in the heart of the new Downtown. Designed by Avinash Malhotra architects, with amenity design by the Rockwell Group, 2 Gold offers an array of studio, one, two, and three bedroom apartments. Two Gold provides a well-deserved escape with an amenity package designed to help release tension, even for those in high-stress jobs. From elegant common spaces with custom furniture, to a fully equipped gym with the very latest in cardio machines, down to our heated lap-pool and 9000 sq. ft. rooftop terrace, all amenities are designed to provide the ultimate downtime experience. Additional amenities and services include 24-hour concierge service, club room with full-sized billiards table, playroom, bicycle storage and on-site parking garage. Situated in the one of the city's oldest and historical thoroughfares, where New York City began, this dynamic neighborhood offers an exciting mix of green spaces, boutique shops, A-list bars, Michelin starred restaurants, markets, movie theaters, live music venues, museums and galleries. Whether you seek a new adventure at Governor's Island or like to people watch on the quaint cobblestone block of Stone Street, this is the neighborhood for you. Please contact Justin Duffy to arrange your private tour.